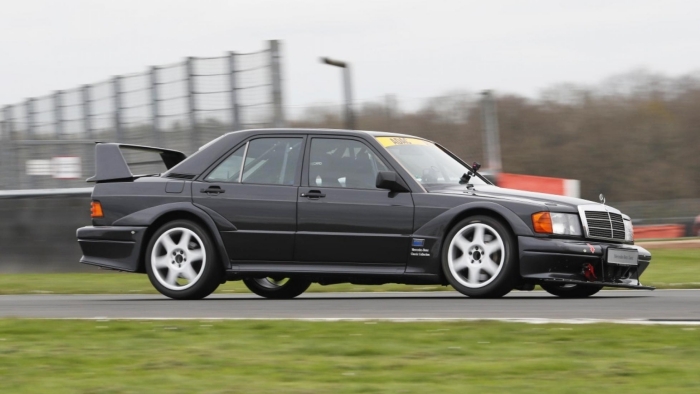 How good does a Mercedes 190E 'Cosworth' racecar feel today? 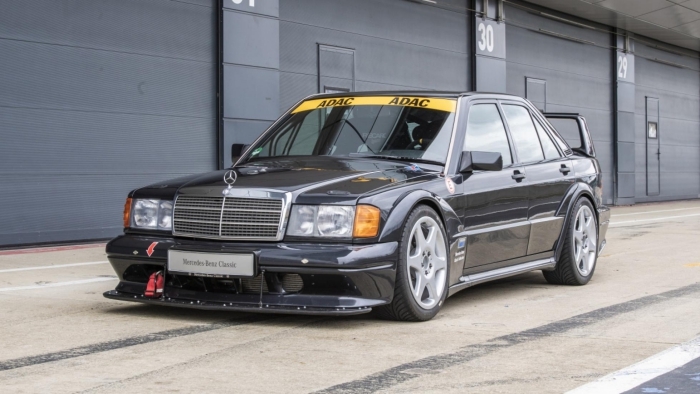 Home Planet TopGear How good does a Mercedes 190E 'Cosworth' racecar feel today? 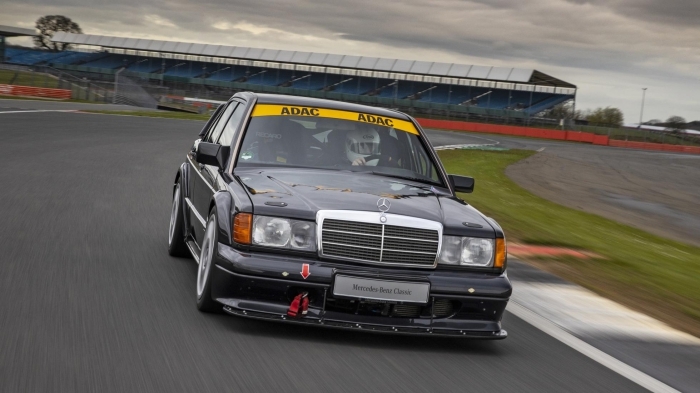 Given I’m in an exquisite-looking Mercedes 190E racecar on a mildly moist track – and the assembled onlookers comprise several of the company’s racing drivers, not least a mildly famous man named Lewis – I opt for ‘on’. It’s a cowardly but unwittingly relevant choice to have made. 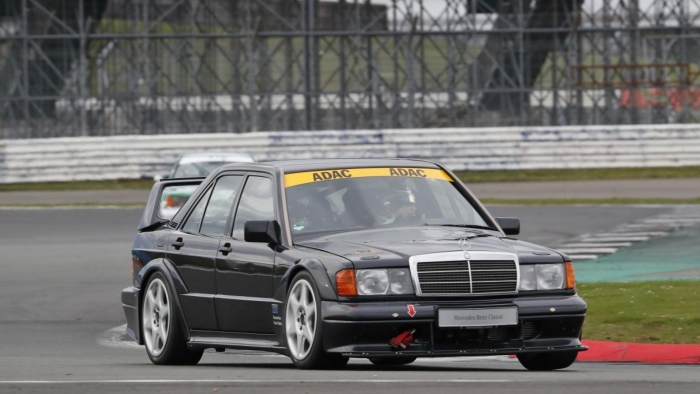 The 190E DTM this car relates to was one of the pioneers of anti-lock braking in motorsport, and to switch it off would not only disrespect the meticulous work of its engineers, but go against the preferences of DTM royalty himself, five-time champion Bernd Schneider. 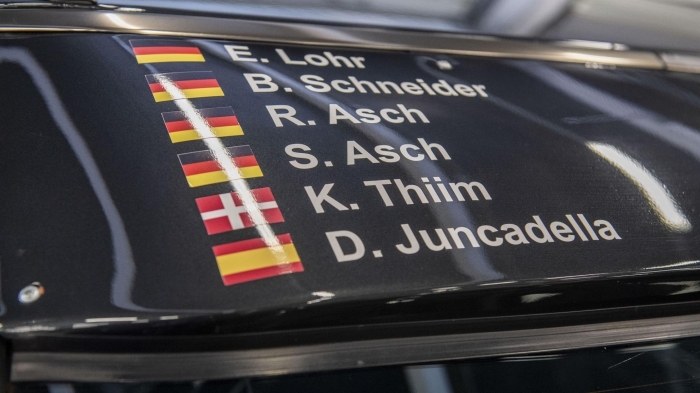 “All the cars I raced before this had no ABS,” Schneider tells me, “but then I tried it for the first time in 1991, when I replaced Michael Schumacher in his 190E DTM when Mr Jordan took him to Formula 1 with four races to go. I’ve not wanted to drive without it since. 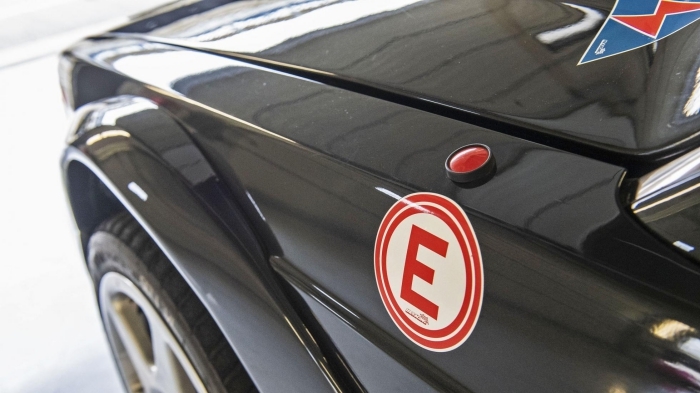 With the Schneider seal of approval, then, it’s time to drive the car with his name emblazoned on the rear window. 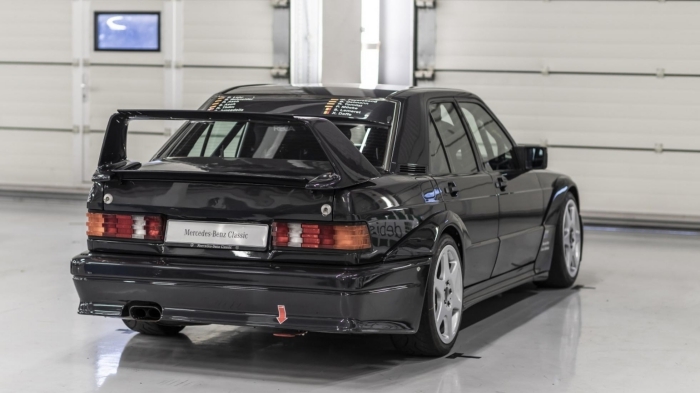 This isn’t a full DTM spec car like Schumacher and Schneider raced back in the early 1990s, rather the 190E 2.5-16 Evo II road car which homologated those German touring cars, but with a few choice mods that help it now compete on track. 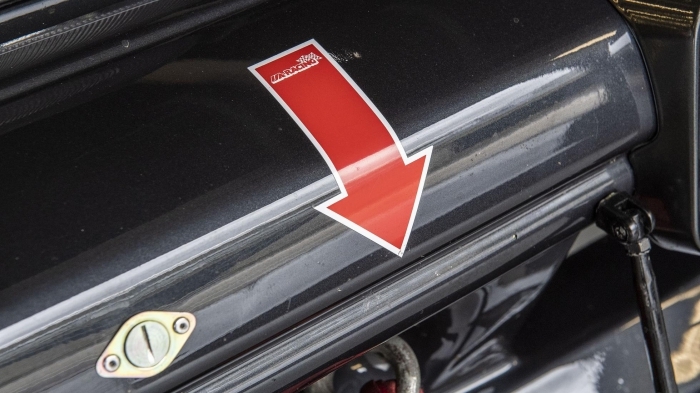 Much is shared with those early DTM cars, however, not least its manual, dog-leg pattern gearbox. Slide the seat forward enough to properly use the clutch and the deeply dished suede-rimmed steering wheel is suddenly buried in your chest; a dose of intimidation, curiously offset by the lovely tweed cloth still inside the doors. So, ABS flicked on, gearstick across to the left then down, I pull gingerly out of the dry garage and into the wet Silverstone pitlane, Schneider, Hamilton and a whole host of others ready to be vastly let down if this one doesn’t come back looking as fist-bitingly brilliant as it does currently. I need not have worried. Racecars have a habit of doing this; they look brooding and menacing from the outside, making your heart pound against your ribcage, before their intimidating rows of barely fathomable switches ensure it’s practically bursting out of your chest by the time the harnesses have clamped you inside. But then the wheels get rolling, and you experience just how free of slack and hesitation they are compared to even the best road cars. Your fingers, feet and bum have an instant, unfiltered stream of information to send straight to your brain, and you drive with utmost confidence right from the off. So it goes here. The steering is wonderfully full of feel but so instant in its reactions, and despite the wet circuit there’s no knife-edge to the car’s grip limits. 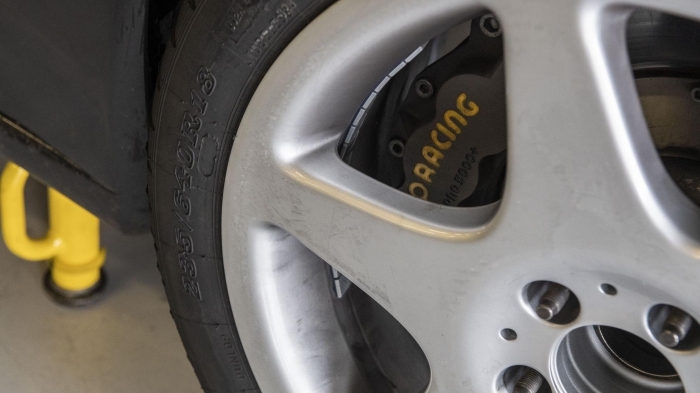 And those brakes are, naturally, wonderful. It’s just a lovely, friendly, deeply communicative car to drive, and I spend the next few laps relishing – and trying to wring as much as possible from – one of the all-time great engines. 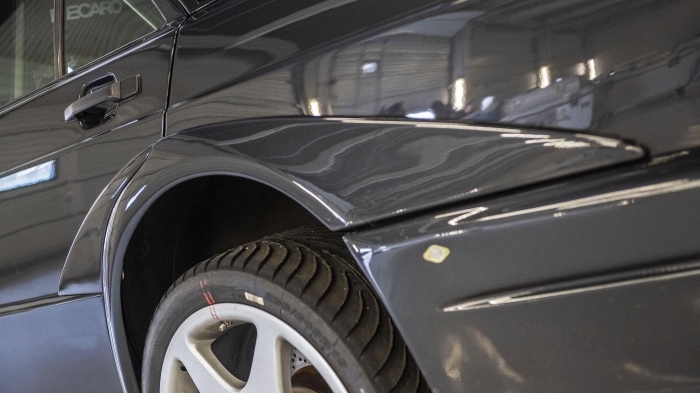 This Evo II runs the larger, 2.5-litre four-cylinder engine from later in the 190E’s life. Here it develops around 240bhp, but the DTM racecars used the same engine tuned up to around 380bhp. It’s a complete pleasure hearing it today. 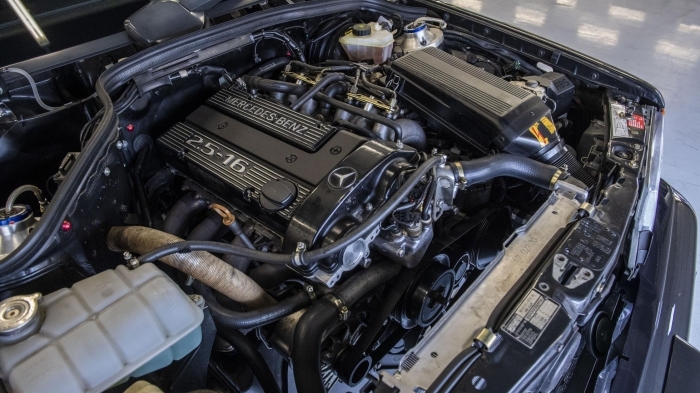 This car doesn’t quite rev that high, but 8,500rpm is still more than a treat in our increasingly turbocharged world. The gears are short and the engine just screams metallically between them, encouraging a game of how high I dare rev before going for the slightly brain-scrambling ‘down for third’ then ‘up for fourth’ changes of the dog-leg ‘box. I’m desperate to nudge the limiter but not lunch the engine, conscious of the rather illustrious audience that’ll hear the bang first. 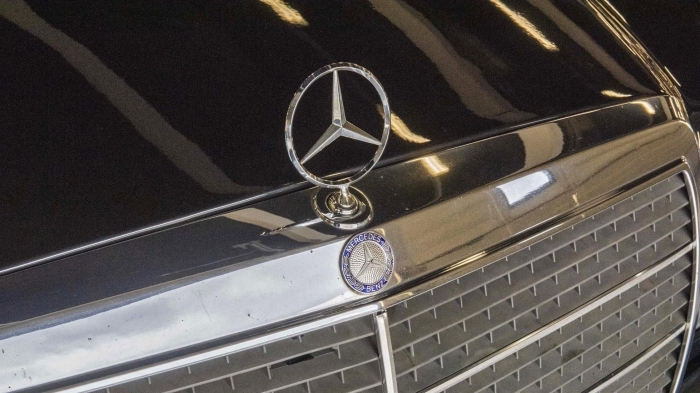 But it really is the only bit about this car that frays my nerves; it otherwise possesses all the elements of a car I want to go brushing competitors’ door handles with. “There was a little contact on track, which I was not used to,” recalls Schneider, as he reminisces about his first races in the 190E back in ‘91. “It was completely different to all the racecars I had driven before, especially when I’d come from Formula 1 and sportscars. There was very high competition; we had more than 35 cars on the grid and you had to qualify in the top 16 to go straight to the race otherwise you had qualification races. 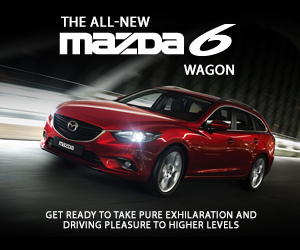 Pushing is something it encourages, though, those foolproof brakes inviting you to bury the pedal late and deep into the corner, juuust loosening the rear axle enough to help you into the turn. The E30 BMW M3 is the contemporary sports saloon whose values are flying through the roof, but the 190E must surely be as magical to drive.